As some of you might have noticed, we recently overhauled the ShiftNote home page (the first page you see after signing into ShiftNote on your computer.) It is available to all management level users, and you can currently switch back and forth between the old and new version by way of the beta link in the upper right corner of the screen. The new home screen features an updated layout that should make needed information easier to find. At first glance you can see the weather, your To-Do list, any upcoming events, and any unread Daily Log entries for each location you have access to. The stats are now accessible via the Weekly Stats section, laid out in way that will let you see a week of data at a time so that you can compare how your business is doing day-to-day. You can also export the data via spreadsheet format. You can now reply directly to a Daily Log post right from the home page without navigating over to the Daily Log to find when and where the post occurred. 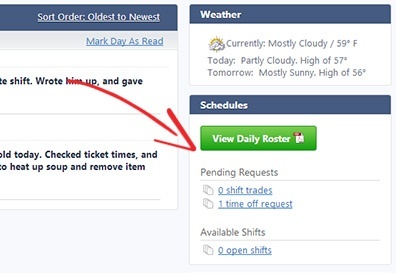 If you use the Scheduling portion of ShiftNote, you will see an area on the new home page that includes any actions waiting for your approval such as time off requests and shift swaps. 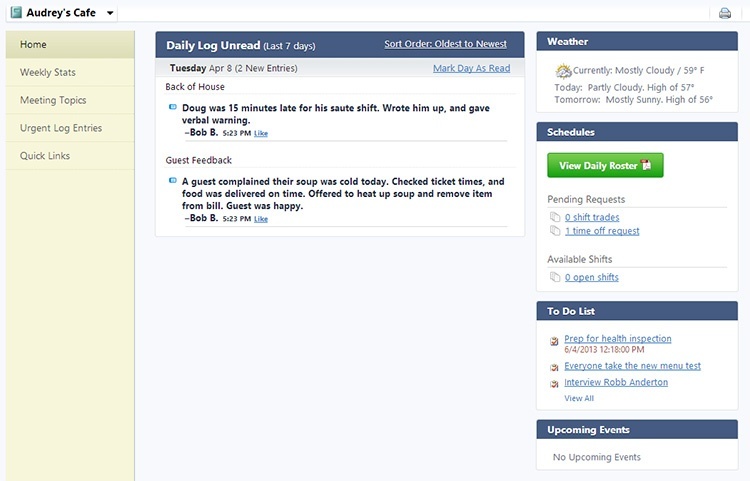 This section also includes a way to easily access the Daily Roster so that you can see all employees scheduled to work that day. We're happy to be able to provide these new updates to you, and we hope that you like them! If you have any feedback on the updates, please provide them in the comment area below, or contact us at any time.